Turkey has sharply cut its growth forecasts for this year and next year in its new economic program, naming “stabilization, discipline and transformation” as the main pillars of the economic outlook. In a presentation in Istanbul on Sept. 20, Treasury and Finance Minister Berat Albayrak said economic growth would be 3.8 percent this year and 2.3 percent in 2019, both revised down from forecasts of 5.5 percent. “We will be balancing the economy. In this vein, we will see a gradual growth increase from now on. Our main goal is to establish 5 percent growth from 2021 onwards,” Albayrak said. The Turkish economy grew by 5.2 percent this April-June, preceded 7.3 percent in the first quarter of this year, 7.3 percent in October-December 2017, and 11.5 percent in the third quarter of last year. “Our second pillar is fiscal discipline, and our third pillar will be change in economy to take it toward value added areas to increase production capacity and exports in the long term,” Albayrak noted, adding that a new unit, called “Public Finance Transformation and Change Office,” in the ministry was established. “It has members from other ministries. It will not only execute austerity measures and determine new ones, but it will also be responsible in finding new revenue boosting measures,” he said. According to the new program, Turkey is targeting a 1.9-percent budget-deficit-to-gross-domestic-product (GDP) ratio this year, and 1.7 percent in 2021. “We will realize the necessary policies and measures to ensure economic hardships are overcome,” Albayrak noted. “We are aware of the economy’s strong and weak points,” the minister said. One of the biggest obstacles of the Turkish economy has been high inflation, which created a fatal circle with a falling Turkish Lira against the dollar. “We will realize a program to totally fight against inflation,” Albayrak said. The economic program forecasts that inflation would rise to 20.8 percent this year before dropping to 15.9 percent in 2019 and 9.8 percent in 2020. Annual inflation in Turkey rose in August to nearly 18 percent, official statistics showed on Sept. 3, a record since late 2003, after the lira dramatically weakened against the U.S. dollar last month. The Central Bank hiked interest rates by 625 basis points last week in a bid to tame double-digit inflation and put a floor under the lira. The currency had made moderate gains since then. “Decreasing our current account deficit will be another focus for us. We will prioritize the sectors that will contribute to this aim,” the minister also noted. Albayrak said Turkey will prioritize investments in pharmaceuticals, energy, and petrochemicals to reduce its current account deficit, which was seen falling to 2.6 percent of gross domestic product by 2021 from 4.7 percent seen in 2018. He also said Turkey would suspend all investment projects for which the tender process has not been finalized. “Mega projects will be realized through foreign direct investment and international financing,” Albayrak added. 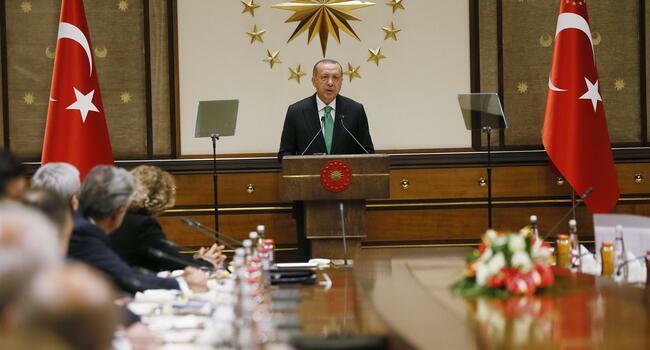 He also said Turkey would revise its social insurance schemes and restructure its incentive scheme for exports. Turkey’s unemployment rate was expected to rise to 11.3 percent in 2018 and 12.1 percent in 2019 before falling to 11.9 in 2020, the presentation also showed. The support for the banking sector was one of the main points that investors awaited to hear. “Our policies will help the banking sector to strengthen, and the real economy to have access to credit at affordable rates, while creating room for credit restructuring if needed,” Albayrak said. “Making sure that the lenders continue financing businesses is one of our priorities,” he said, without giving further detail.